Enroll yourself for The Cavalier coaching classes for Best Results. 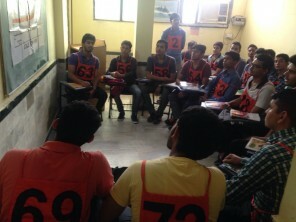 We are the best SSB Coaching Institute in Delhi, India. We have the most experienced team of officers including Ex SSB Presidents (interviewing Officers) , GTO's and Psychologists from Army Navy and Air Force. The curriculum is designed to improve the personality of the candidates rather than make them cram up answers and reactions. The personality traits of each individual are analyzed critically and grooming modulated accordingly. The candidates’ problem solving skills are sharpened to meet the requirements of the assigned tasks at the SSB. THE CAVALIER HAS THE BEST LAID OUT OUTDOOR TASKS TO INCLUDE Progressive Group Tasks (PGT) , Individual Obstacles (IO), Command Tasks and Snake Race to give hands on experience to all candidates. We have successfully helped many candidates to make their career as officers in the Defence Forces. Why Choose Cavalier SSB Coaching Institute ? Being One Of The Oldest Academies The Cavalier Has Had The Distinct Advantage Of Evolving And Updating Its Teaching Techniques And Infrastructure, Matching The Latest Developments In SSB Interview Centers. We Have A Team Of Officers Who Are Ex Ssb President, Gtos, Psychologists From Army, Air Force And Navy Guiding You Towards Success. The Cavalier Has The Distinct Honour Of Sending The Maximum Number Of Candidates To IMA, OTA, NDA, Naval And Air-Force Academies. All Students Are Put Throug Out A Mock Test On Arrival. Their Qualities Are Analysed And Individual Counseling is Done By The Psychologist. At The Cavalier All Candidates Are Given A Number Of Practices Of The Screening Test, Including Verbal, Non-Verbal Reasoning And Ppdt. At The Cavalier Each Individuals Personality Traits Are Analysed And The Candidates Are Groomed Individually. All Psychological Tests Are Analysed, Explained, Practiced And Corrected Repeatedly. Special Emphasis Is Laid On English Fluency And Personality Development Of The Candidates. For Better Interaction And Practice, We Have A Minimum Of Two Batches Running Concurrently. Free SSB Coaching For Wards Of War Widows / Defendants Of War Widows. Fee Concession For Defence Personnels / Their Wards, Military School & Sainik School Students. Guidelines On How To Take On Each Test/Task At SSB Interview Are Enumerated Below. These Guidelines Will Help Students To Overcome Their Misplaced Fears About SSB Interview. However, These Guidelines, Unless Practised In The Real Time Environment, With On The Spot Corrections And Moderations By The Experts, May Not Suffice. Provides opportunity to practise in near real time environment. Coaching enables the candidates to participate in a group and experience the group dynamics. This cannot be achieved at home. The response/performance is commented upon and corrected by expert Psychologists, GTOs and Interviewing Officers. Their feed backs are eye-opening. The candidate learns from the behavior and performances of the peer group. Ground Tasks can only he practised in a ground with real tasks and obstacles. The language, formats and design factors of GTO tests/ tasks cannot be understood, unless experienced personally. Personal Interview by the Interviewing Officer can never be experienced on your own. Maj Sunil Chopra (Director) LLB, MSc, PGDM, Dip. in Training Development, Sena Medal : A Military School Belgaun, IMA and Defence Services Staff College Alumni. Sena Medal (Gallantry) and Army Chiefs Commendations TWICE. Qualified in Training and HR Development with 8 yrs teaching experience in Army, Civil and SSB aspirants. Cdr.. K K Dua (Retd) : MSc(Physics) from Punjab University Chandigarh and PG Diploma in Business andIndustrial Management from IMDR Pune. He is a graduate of the Defence Institute of Psychological Research New Delhi. He worked as Senior Psychologist with SSB at Allahabad, Bangalore and Bhopal. He has been trained by Insights Learning & Development UK in their Personal & Organizational Development System. He has 40 years of teaching / administrative experience, of which 20 years with Indian Navy, 12 years with industry at Mumbai as Consultant in the area of HRD, Personnel Selection and Appraisal, and eight years as senior faculty with Management Schools. Apart from teaching at Cavalier, he is also a visiting faculty with DU and MDU Rohtak. Wg Cdr D Mathur, VSM (Interviewing Officer) : Experienced Interviewing Officer, with tenures at Dehradun and Varanasi SSB Centres. Also served as Chief Instructor at Defence Institute of Psychological Research, New Delhi. He has authored three books and is also recipients of Vishist Sewa Medal and Commendation by the Air Chief. Gp Capt HC Singhal (Psychologist) : M.Sc (Physics) and M.Ed from Kurukshetra University, University topper in Graduation, Joined Meteorological Branch in Indian Airforce in 1975. Trained as a psychologist at DIPR and served as senior psychologist at 1 AFSB, Dehradun. Col. Arun Behl, MSc, EMIB (Interviewing Officer): An Alumni of NDA and Defence Services Staff College, and Masters in International Business from IIFT.Trained in Interviewing at Defence institute of Psycological Research, he has served as Deputy President and Interviewing Officer at SSB Centre at Bhopal and has conducted 3000 interviews. Gp Capt H L Dhawan (GTO), MA, MEd : From Air force Education Branch. Trained at DIPR as a GTO & having 5 years experience of Selection at No. 1 SSB, Dehradun. Has teaching experience for nearly 4 decades. An Interviewing Officer of repute, he has a deep insight of the Psychological aspects of personality development. Telephone: 011-23010151 Tele Fax: 011-23011282. Contact IHQ-MOD (N)/DMPR at 011-23010151 / 23011282 / 23010097. 2. For queries regarding AFCAT application, admit card, AFCAT centre, and contact – AFCAT Cell. 3. For any queries regarding SSB interview, contact respective Air Force Selection Board detailed for. It was a great experience being here. I learned a lot of things here. I gain my confidence level. Teachers taught us the practical aspects of ssb which helps us a lot. I started my relation with cavaliers with NDA written coaching. i cleared the exam and was confident even before the result.the teachers at cavalier teach and take care of the students. I then came for my ssb coaching,I never had a doubt where to join, I entered cavalier as a individual without ideas and less confident. cavalier turned me over.now leaving cavalier i am confident and sure to pass my SSB .Rest is the effort i put in. MY ADVICE JOIN CAVALIER AND SEE YOURSELF. very good .cleared my written exam. it was a nice expirience. I GOT CONFIDENCE. I GOT TO KNOW HOW TO DEVELOP OUR QUALITIES. Good SSB coaching centre in Delhi. They gave extra time for clearing our doubts. The coaching is not just for SSB interview.. but cavalier also made me a better person. Never have i learnt this much in a duration of two weeks.. I had a great experience at cavalier. 14 day SSB coaching was very good as the all the things being covered and revised. The faculty is very good, helpful and experienced. I joined cavalier in the month of feb'2018. I have to appear for the CDS entry SSB. Before joining this institution i am not having any idea about SSB. Here I learned a lot,from PPDT stories to TAT,WAT,SRT all I have perceived very well now. Here I also get to know about the Officer Like Qualities (OLQ) which need to be inculcate in oneself to become a officer in the indian armed forces. Finally I want to thanks all eminent faculties to support me.